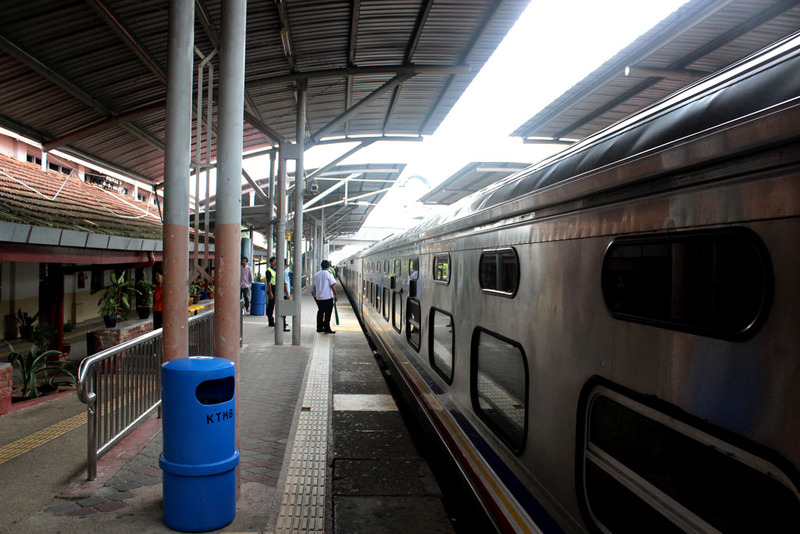 On the morning of the following day (29th March 2013), we checked out from our hotel and headed straight to KL Sentral station. 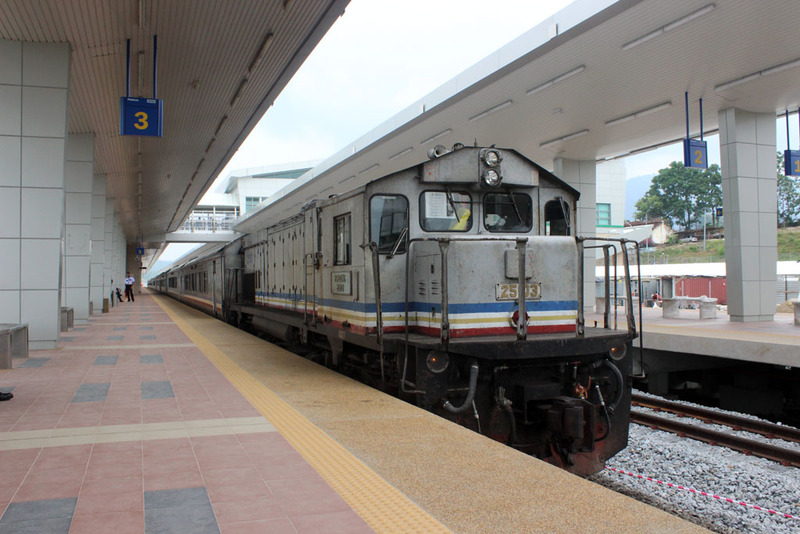 Eddy also awaited us at KL Sentral, because according to the plan, some railfans would also head to Singapore on the same day. But it turned out that we were the only ones who departed to Singapore that morning. 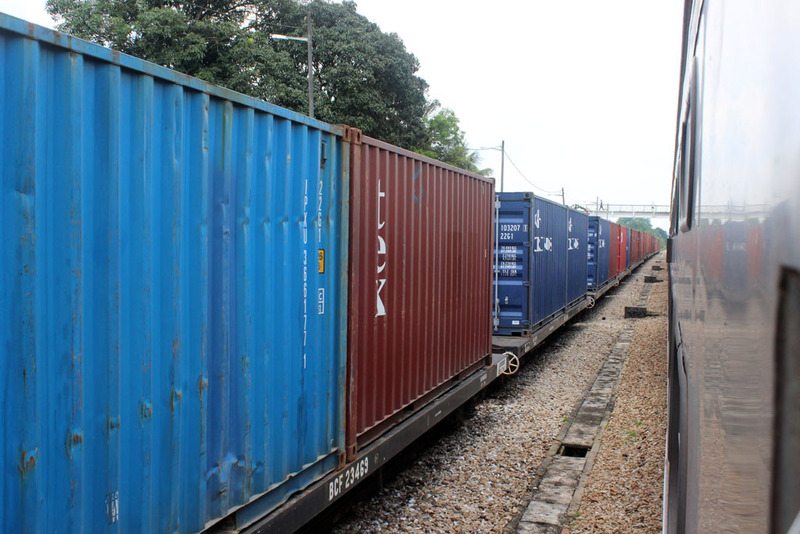 The rest of them would take the overnight train to Singapore. 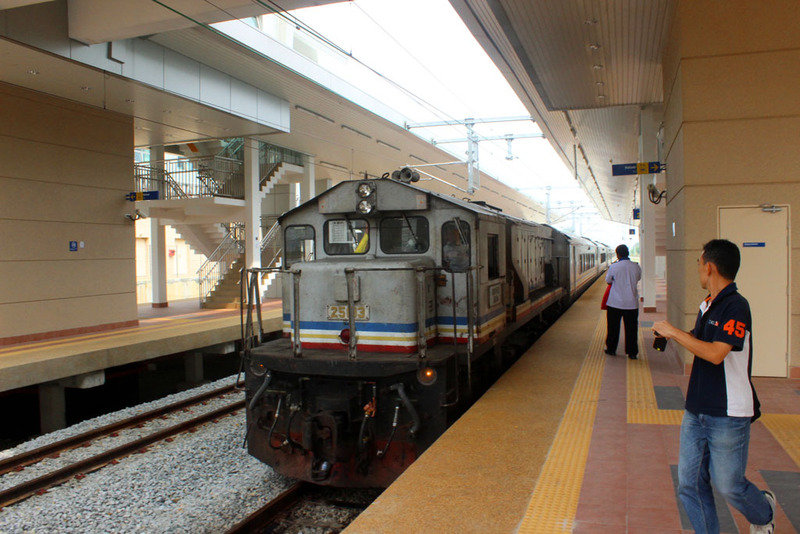 After we bade farewell to Eddy, we went down to the platform and entering our train. 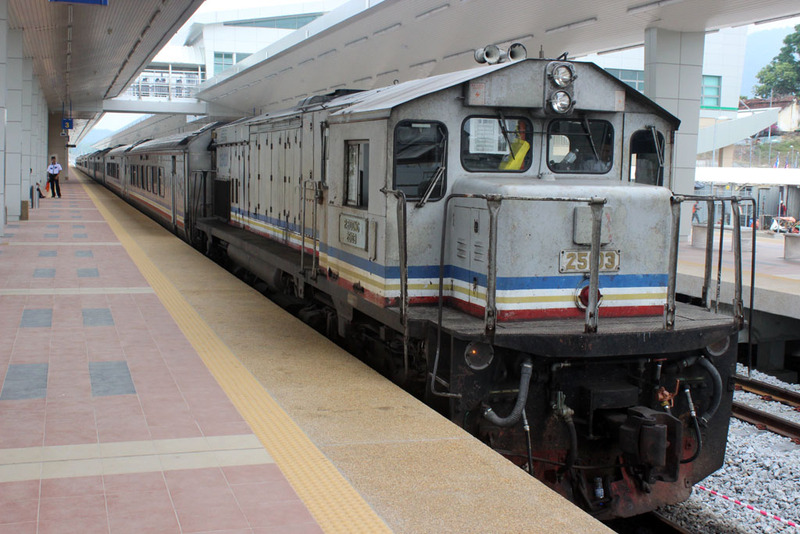 The train that we took is the Sinaran Selatan Express Train. 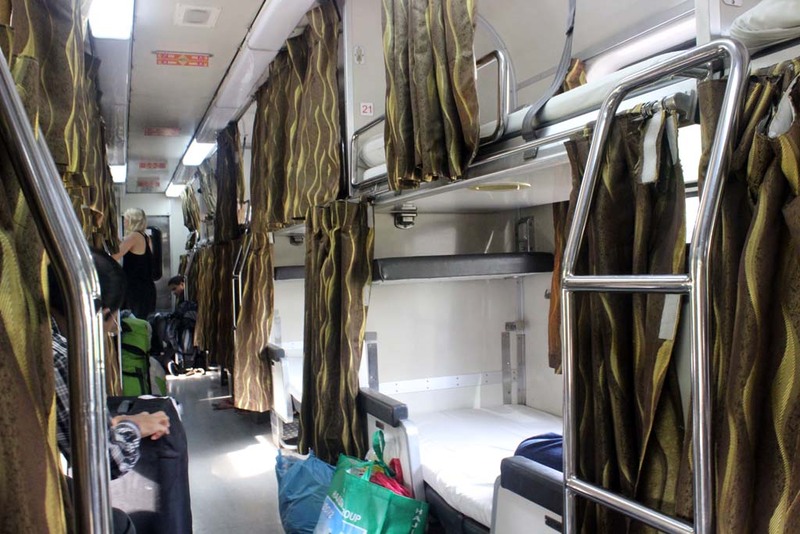 We booked the second class couchette. 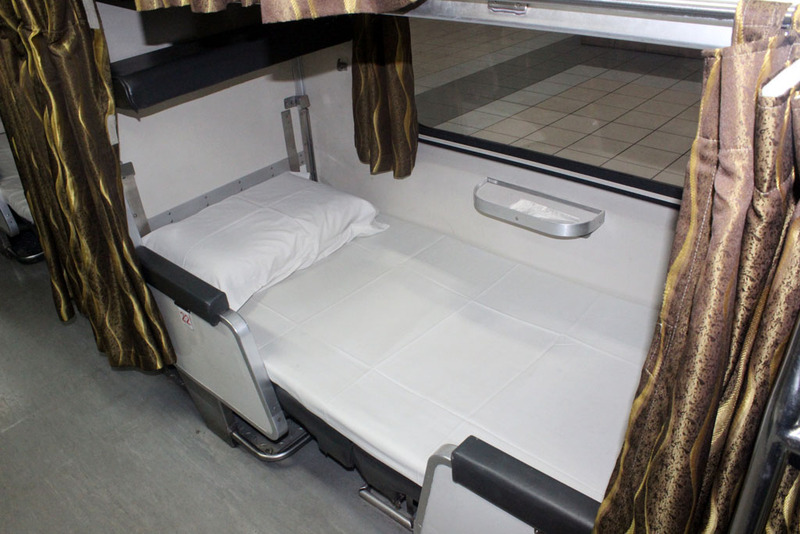 I booked this one, although not the cheapest one, because I want to feel how does it like to travel with sleeper train. 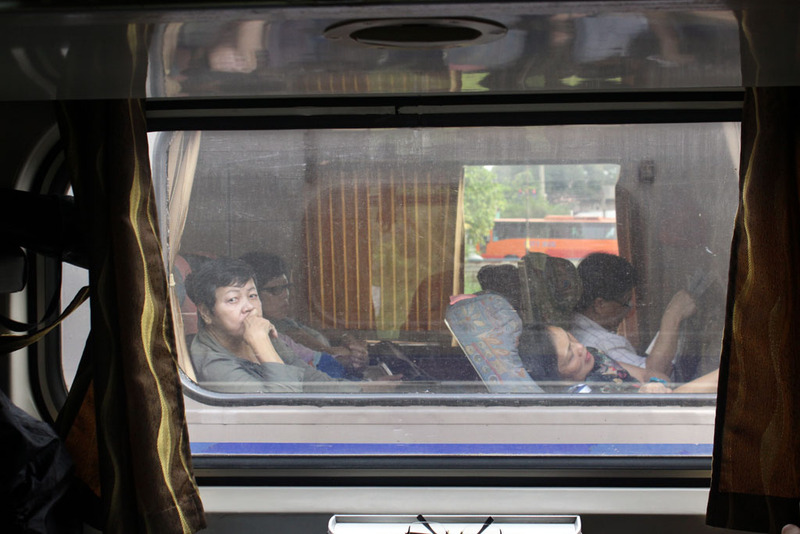 Something that we really miss in Indonesian railway is the absence of sleeper trains. 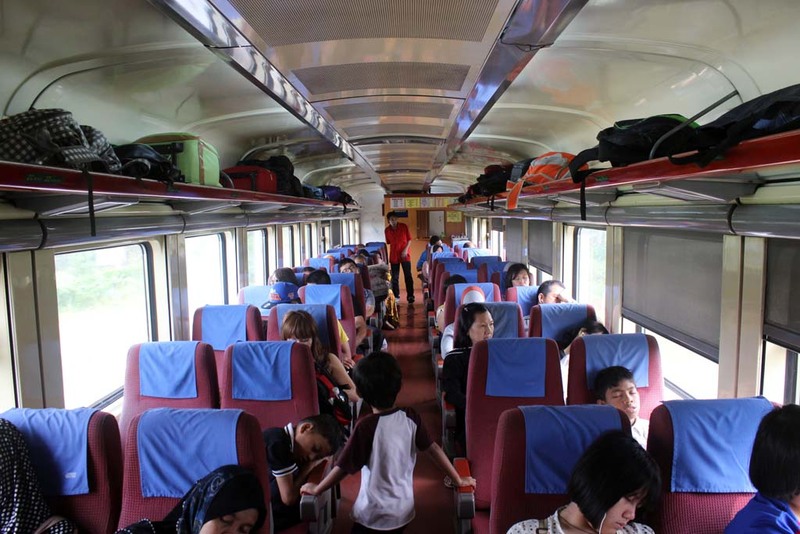 The Indonesian State Railway constantly refusing to re-introduce sleeper class train with all illogical reasons that they could possibly mention. Today’s train seemed to packed. 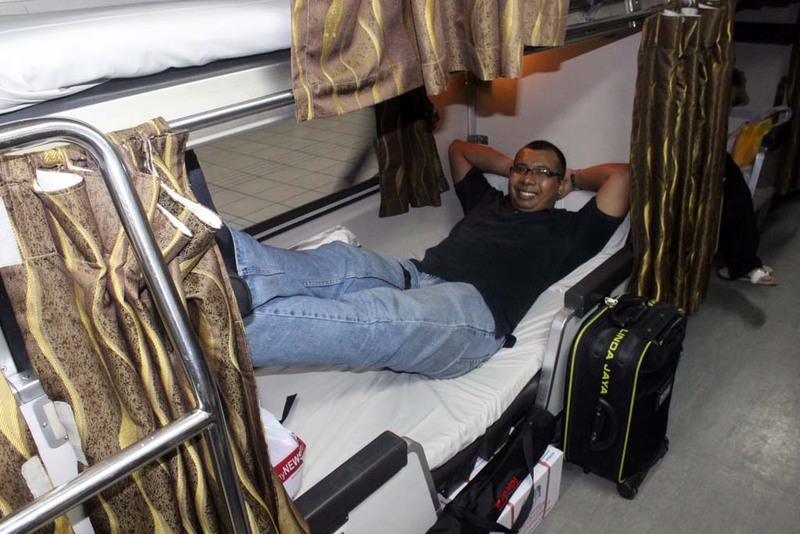 There were no empty bunks in our coach. 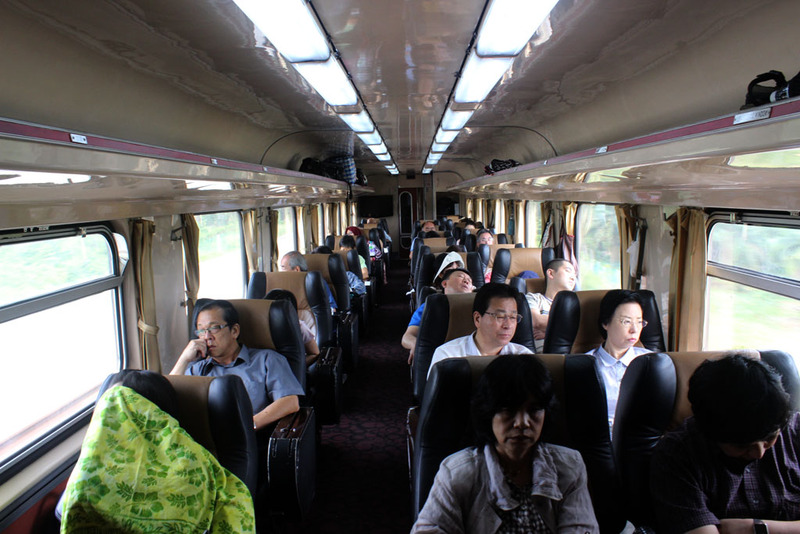 Since it was a long weekend, many tourists take the chance to go to Singapore or Johor. 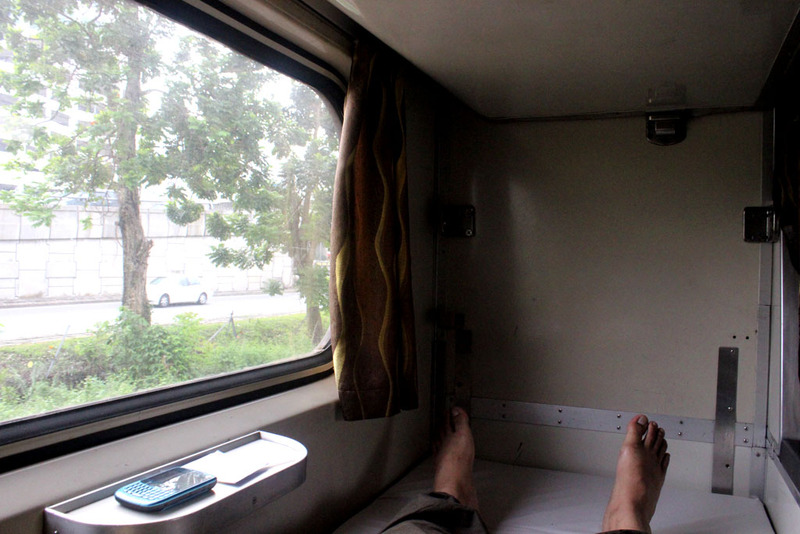 This is what I like about traveling with sleeper train in broad daylight: you could enjoy the scenery while lying on the bed. 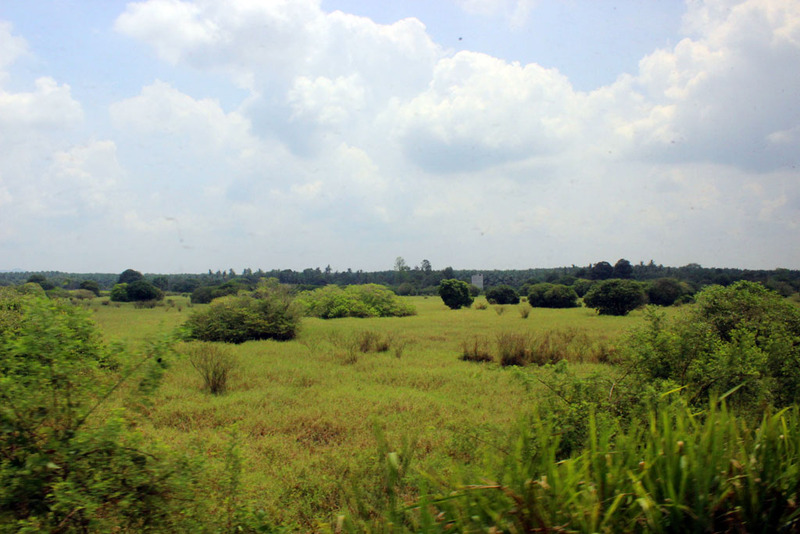 Like this idyllic countryside somewhere between Kajang and Seremban. 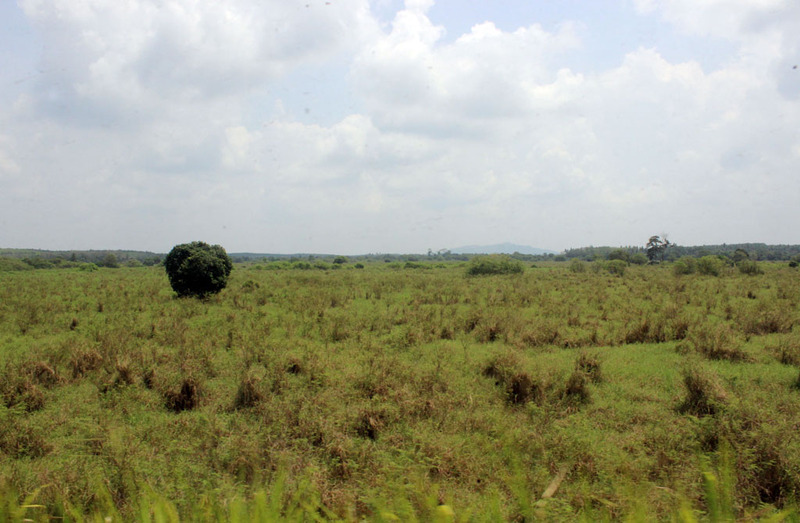 Or this rolling hills at Tiroi. 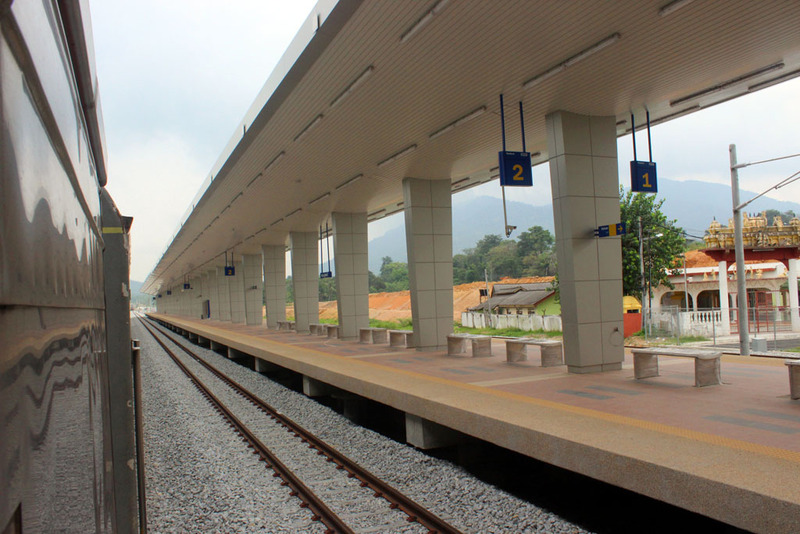 Our train made a brief stop at Seremban. 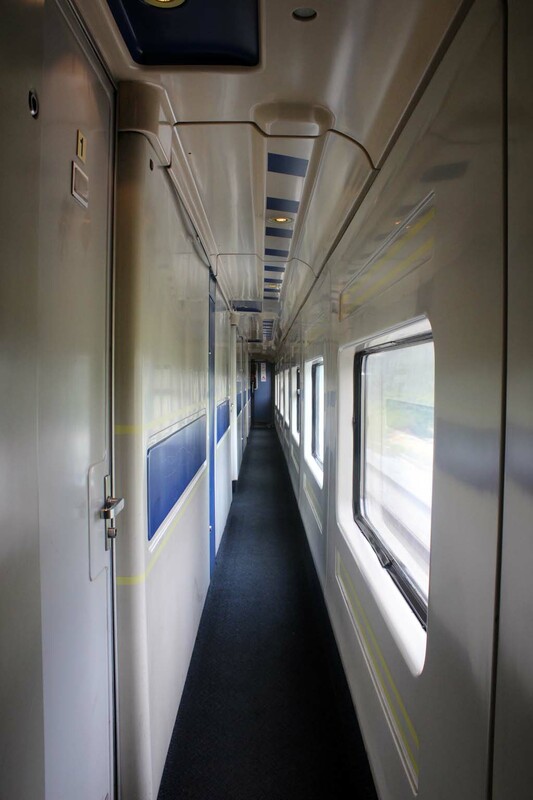 After our train departed Seremben, I began to move to another coach to look at how does the other cars looks like. 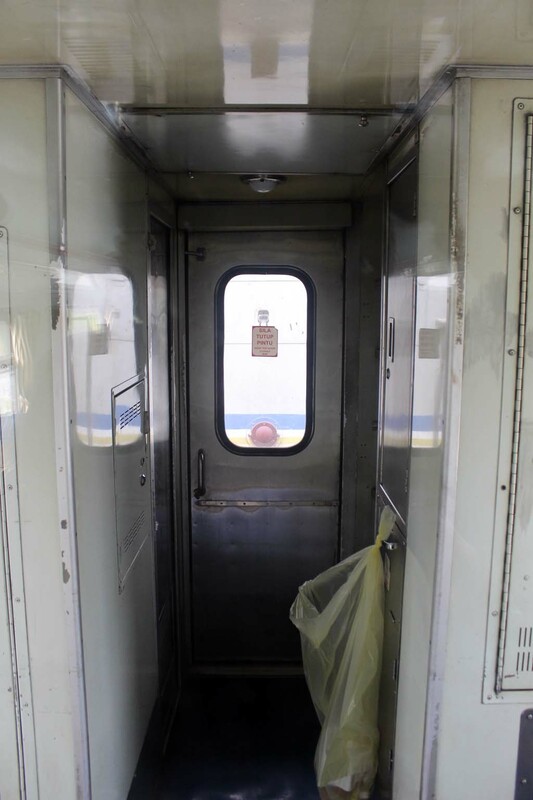 This is the gangway of the first class sleeper coach (ADNF). I think I should take this one, if I traveled at night. 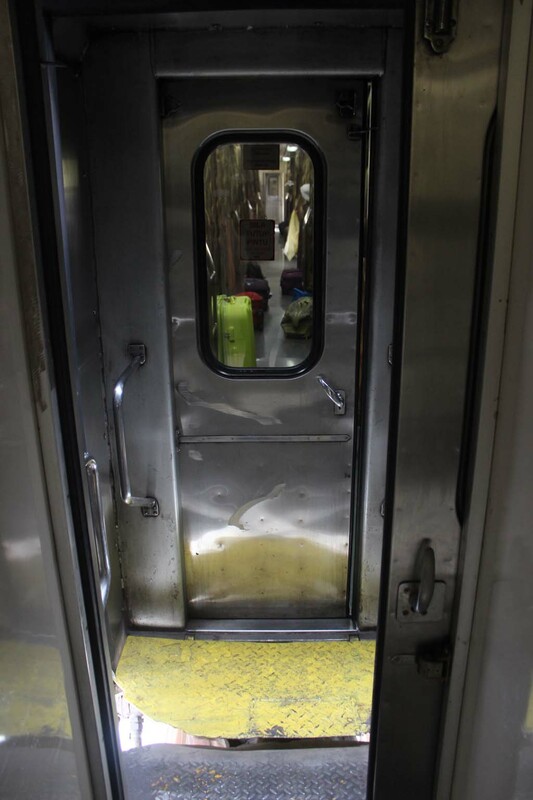 When I looked at the window, I could see the former roadbed of the previous alignment. 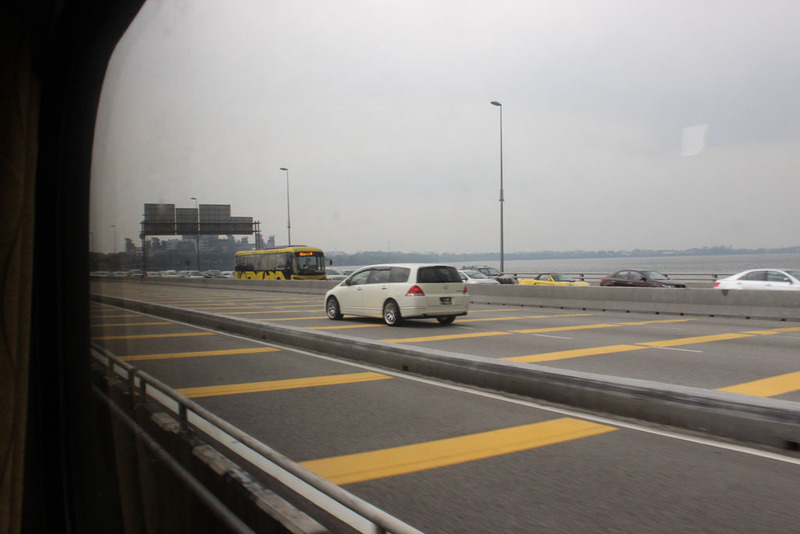 I believe, I traveled on that alignment during my 2011 Malaysia-Singapore trip. 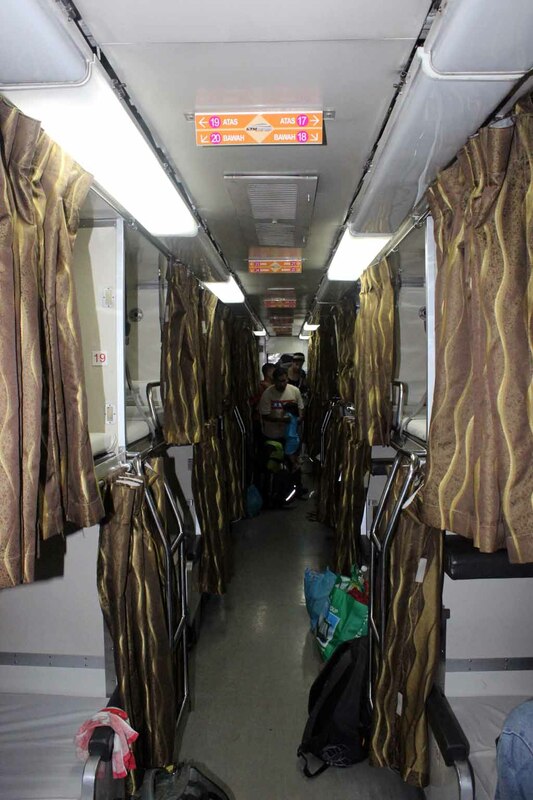 The first class coach looks packed too. The second class looks busy too. I finally came to the section that is located right behind the locomotive. From this spot, we could see the detail of the locomotive’s B-end. 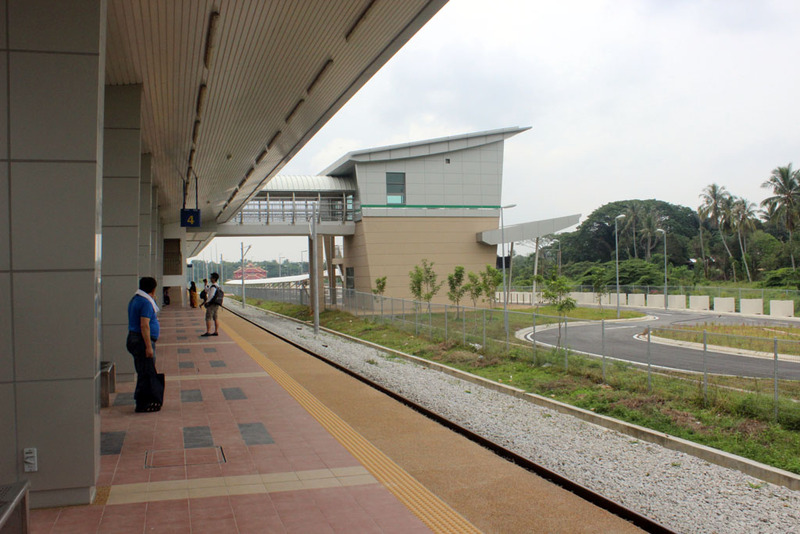 Our train made a brief stop in this newly built station. 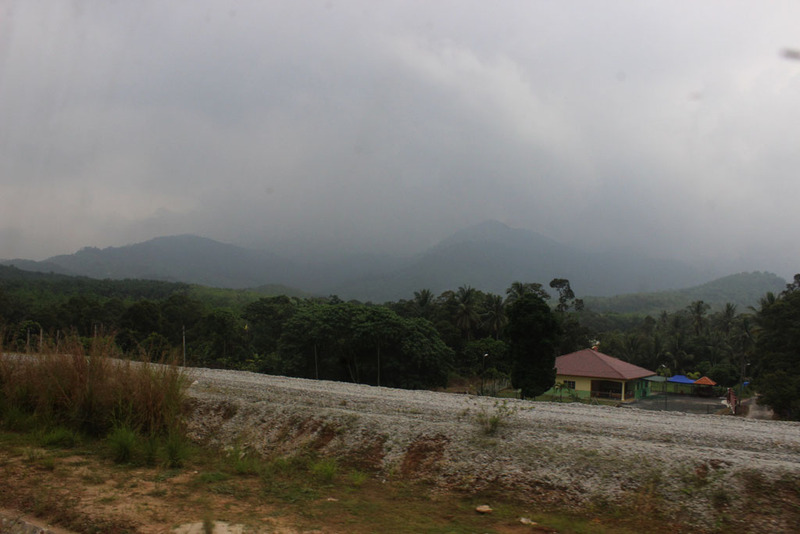 As I peeked on the outside, I found out that we’re stopping at Rembau. I looked at the signal, it was still red. And the station master only stood silent. I take this opportunity to take the train picture, with another passenger. 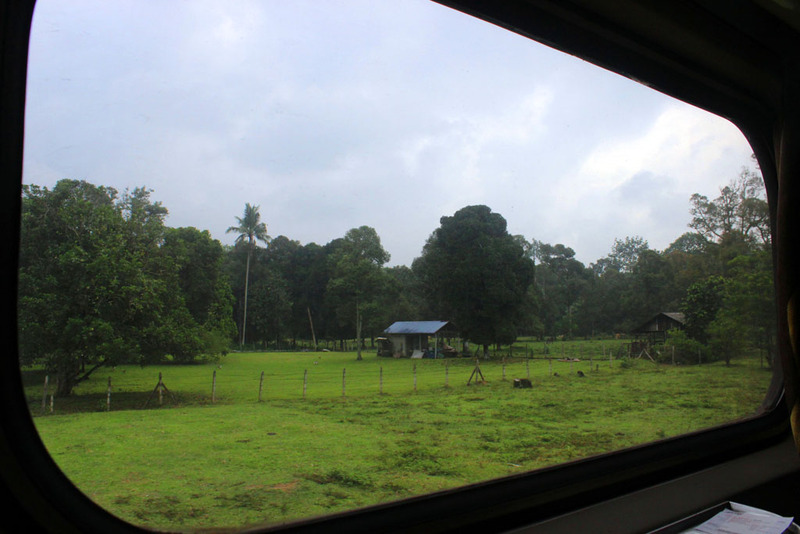 However, as we took a few snaps, the driver suddenly applying the throttle, and the train began to move! So we hurried ourselves and entering the coach. Despite the fact that I hit the coach wall, I didn’t injure myself in the process. 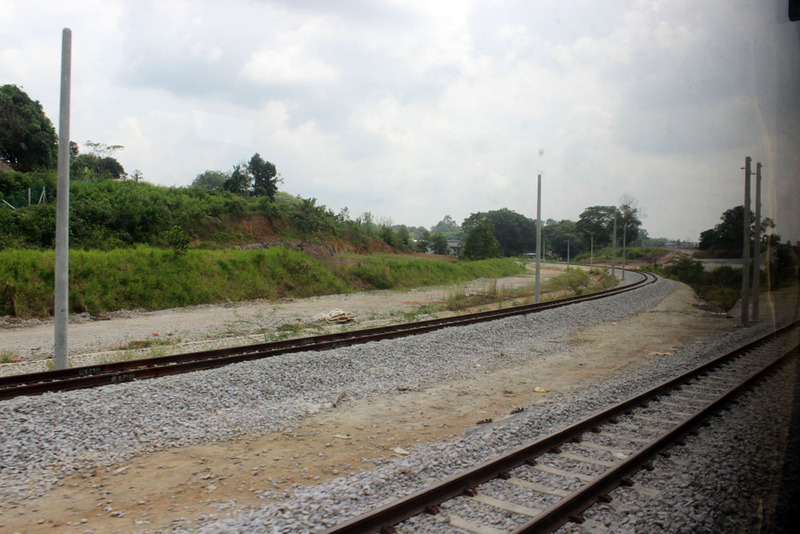 Once I returned back to the coach, I could see the original railway alignment. Some still have their rails in place. 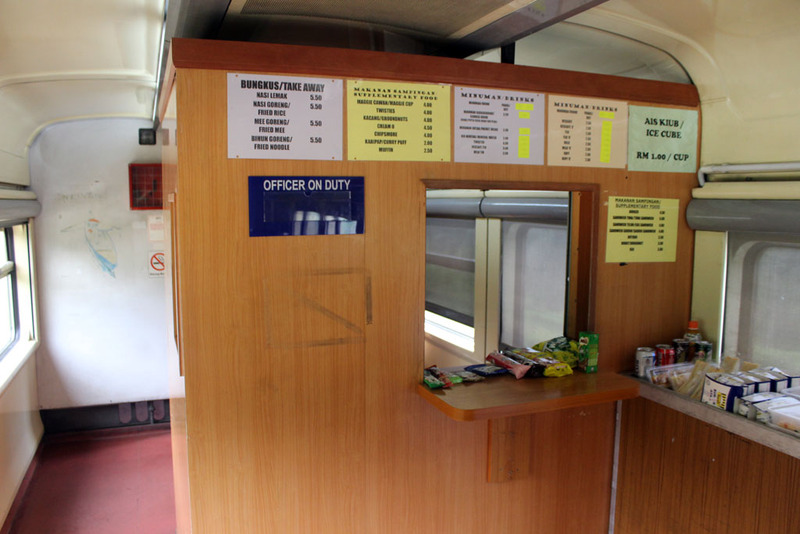 Due to the absence of buffet coach, the food sellers have found way to hold their merchandise by installing the food stall at one corner of second class coach. It’s still a long journey, baby. 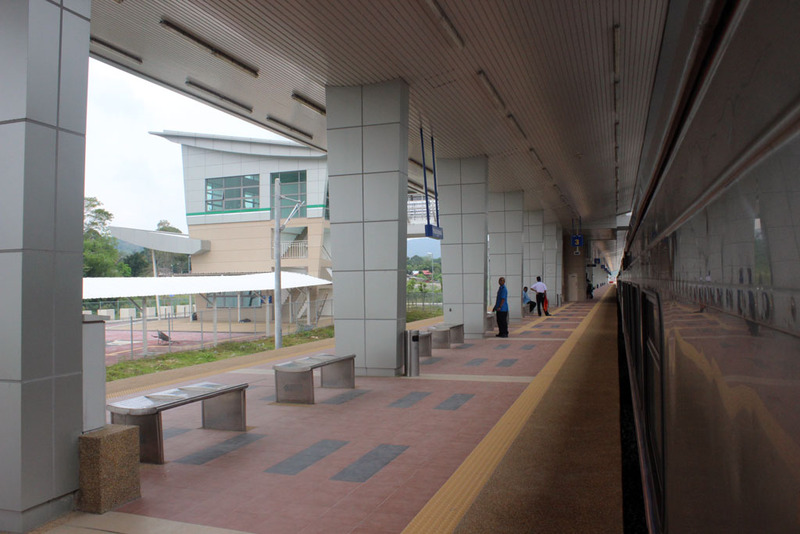 Our next stop is Tampin/Pulau Sebang station. 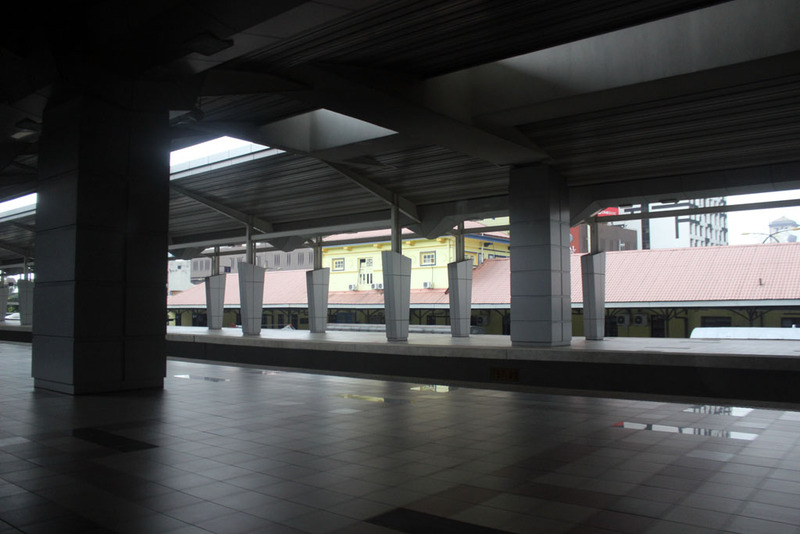 Unlike my previous visit, this time our train stopped in the new station. However, there was one incident when I tried to take the train picture. 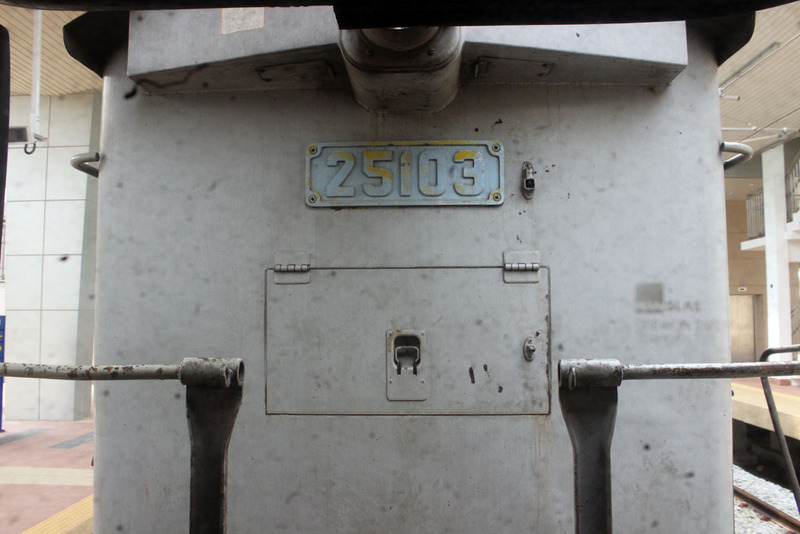 At that time, I saw the driver exiting the locomotive and sat on one bench. I asked him politely how long the train will stop. 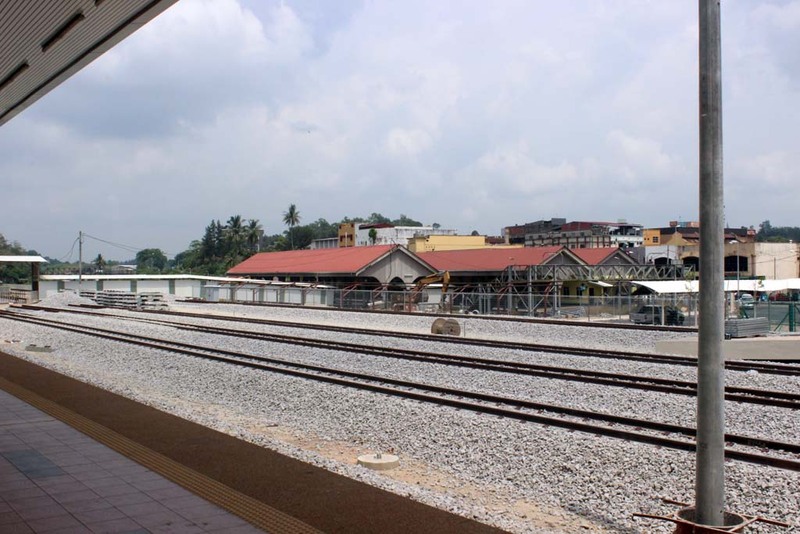 Instead, he began cursing me about the incident at Rembau station. I wasn’t deterred by his cursing, and keep snapping the picture. As I returned back to my coach, he shouted “BODOH!” (Eng: “Stupid!”) to me. I was actually upset by his act. I know I might have done some mistake in Rembau, but the way the driver dealing with me was a gross professional misconduct. Was it worth paying the train ticket if at the end of the day the money that you pay is used to pay someone to say inappropriate words to you in public??? I choose not to confront him further, and hoping that he will get his retribution for his mischief in the future. 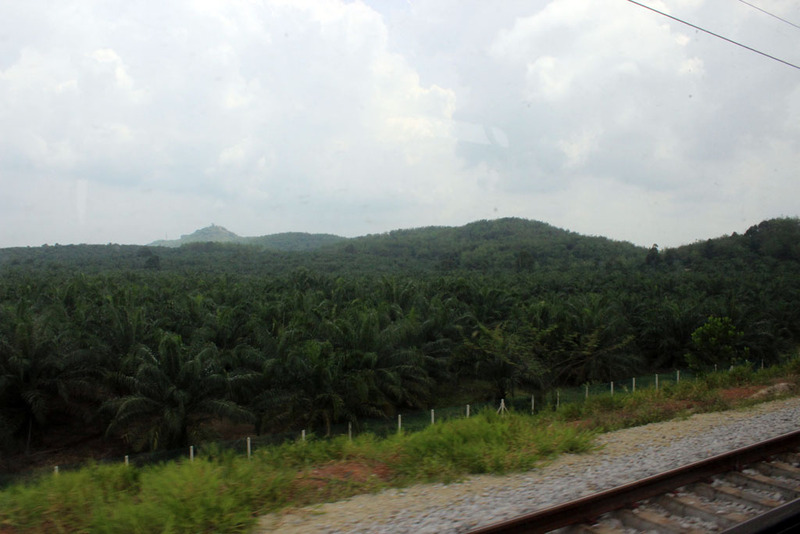 The train soon departed Tampin. 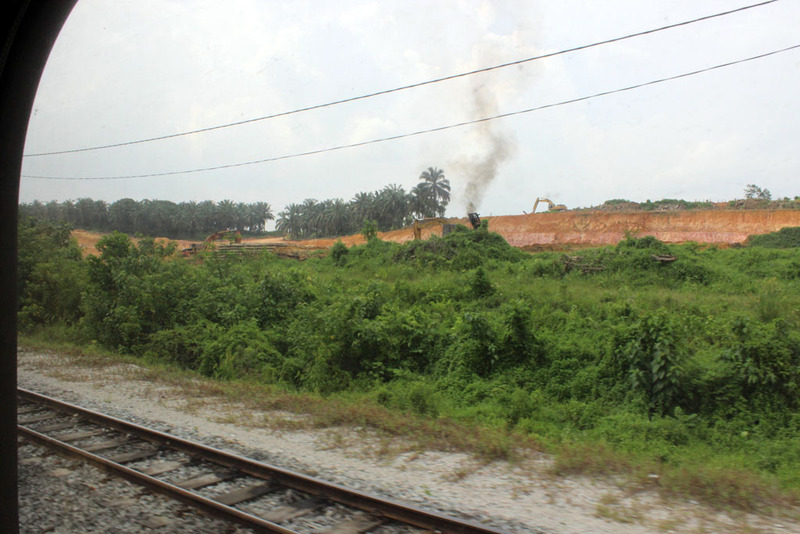 From my window I could see the remains (or what was left) of the old Tampin station. 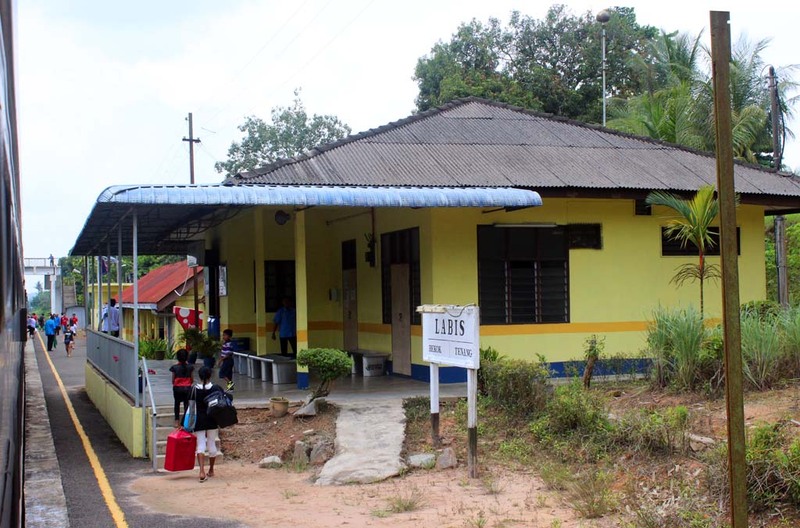 In my 2011 trip, the station was still intact, but now only the name sign remained. The station was located to the left of the picture. Despite of my upset feeling due the previous incident, I tried to calm myself down by enjoying some countryside scenery along the way. 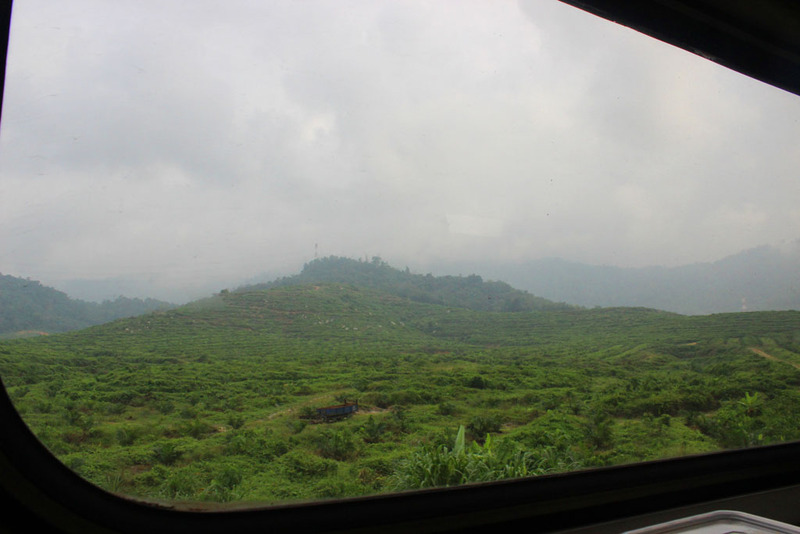 Due to the fact that our train run on the right track (as opposed to the normal left track) it gave the feeling as if we’re traveling in by train in Indonesia. 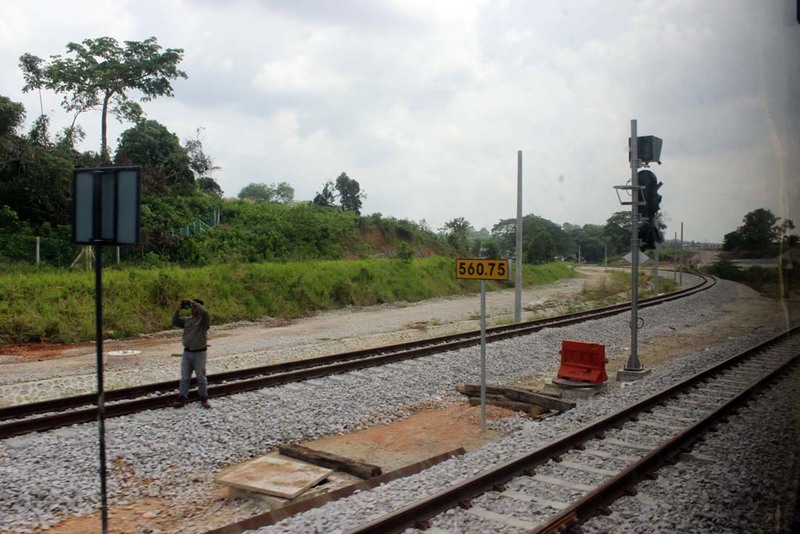 Soon afterward, our train began to enter Gemas station, a major junction station in Peninsular Malaysia. 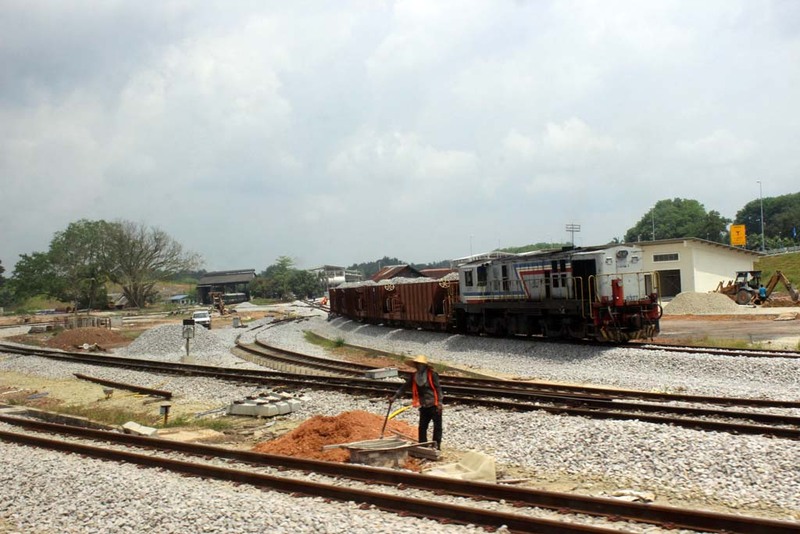 Apparently they’re now building a wye track in Gemas, to speed up the train journey from KL to the East Coast line, without any need to reverse the train in Gemas. 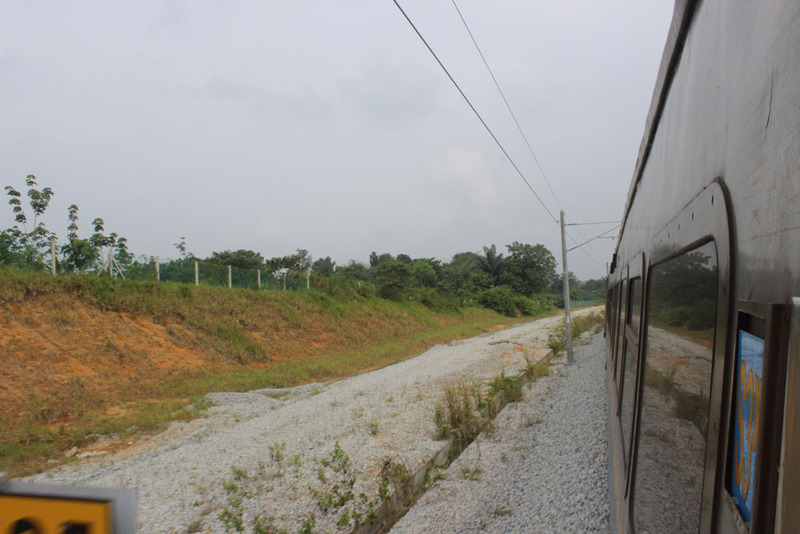 In the distance, I could new alignment of the East Coast line, as well as the original track into the old Gemas station. 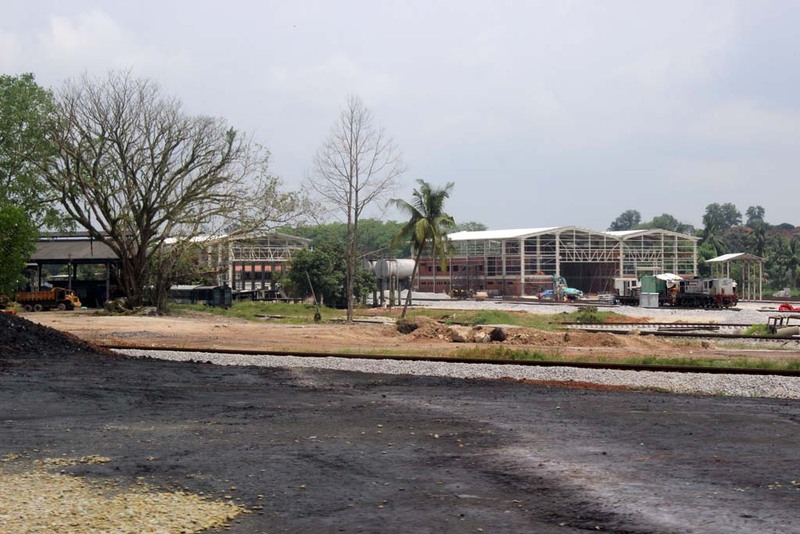 Aside of realigning the tracks, they also build a new locomotive depot, which could also accommodate EMU for the future high speed service. I was quite stunned to see that the old railway station is now abandoned (or partially, pending to the completion of the headhouse of the new station). 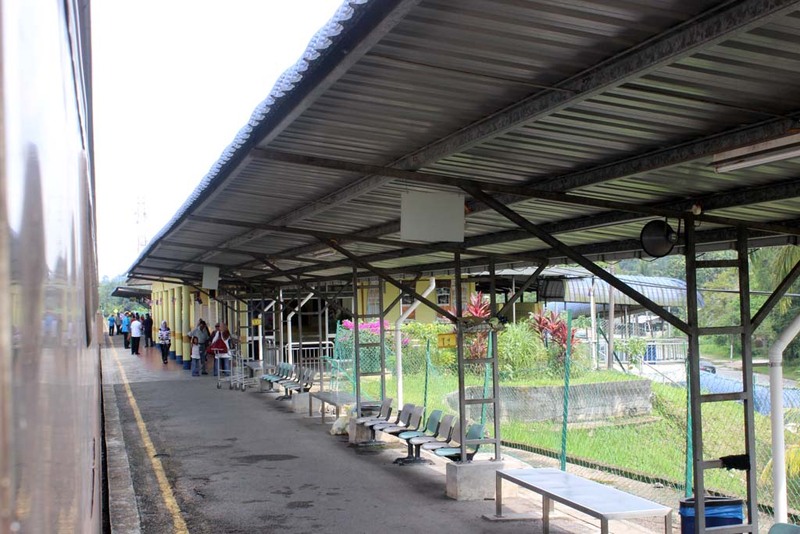 I remember, during my 2011 trip, we stopped in this old station. 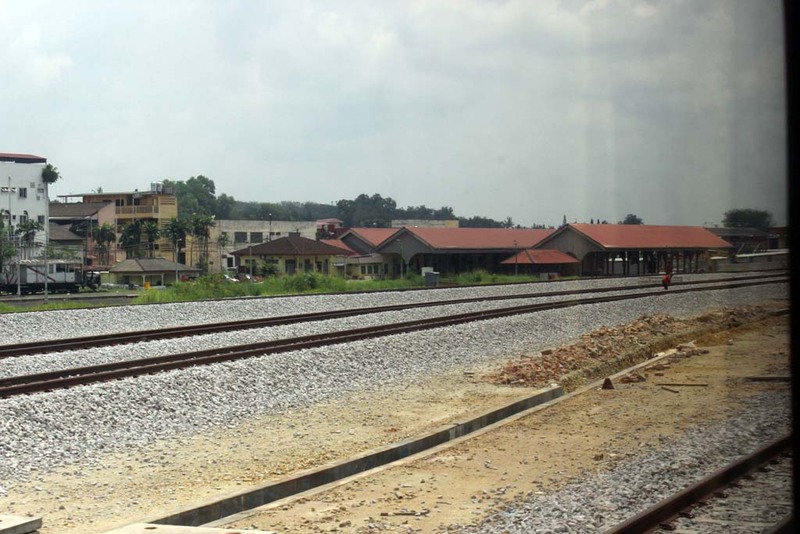 Time moves so quickly…..
From the platform of the new Gemas station, I could see the uncompleted headhouse of the new station…..
…as well as the old station which is now preserved and still used as a ticket counter and entrance. 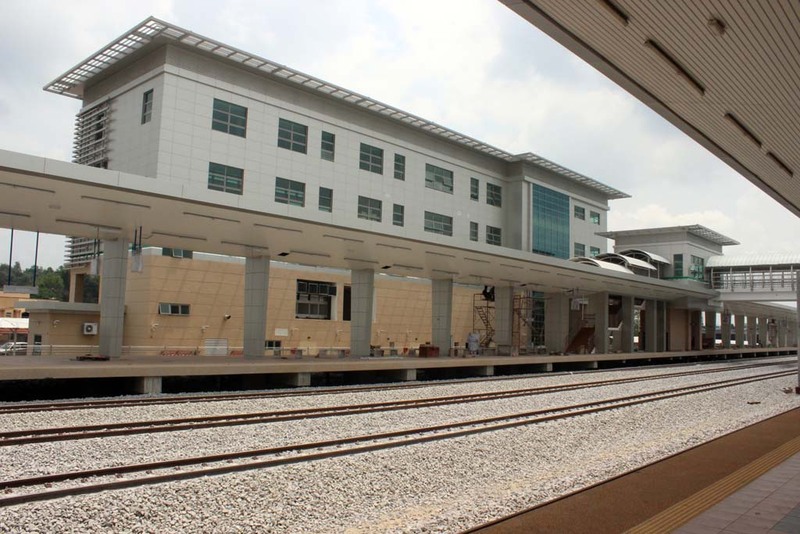 I have to say that the new Gemas station is a very impressive structure. 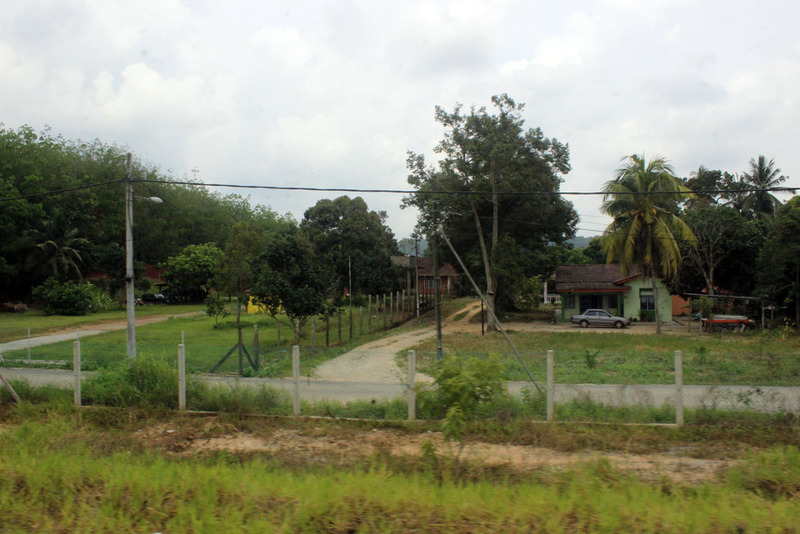 But in my opinion, is quite redundant for a small town like Gemas. 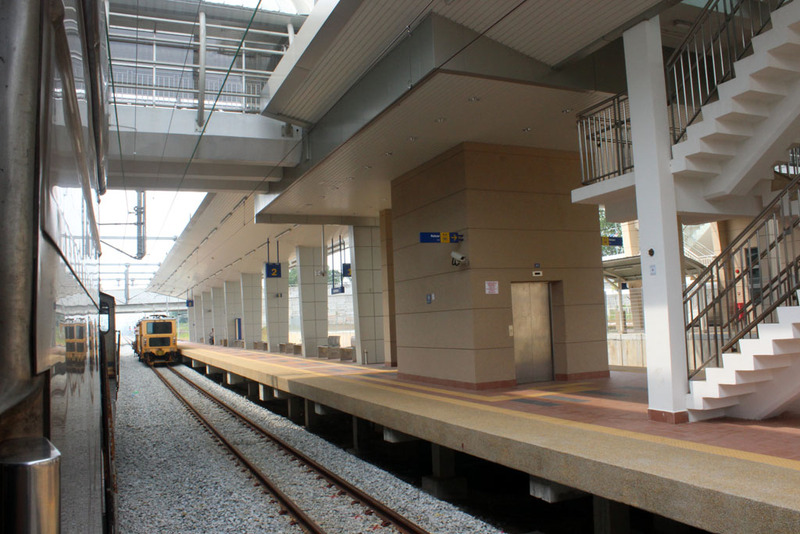 There are other places in Malaysia that need a station of this scale, such as Shah Alam or Subang Jaya near Kuala Lumpur, where their current size is more like a halt when compared to Gemas’s oversized building. 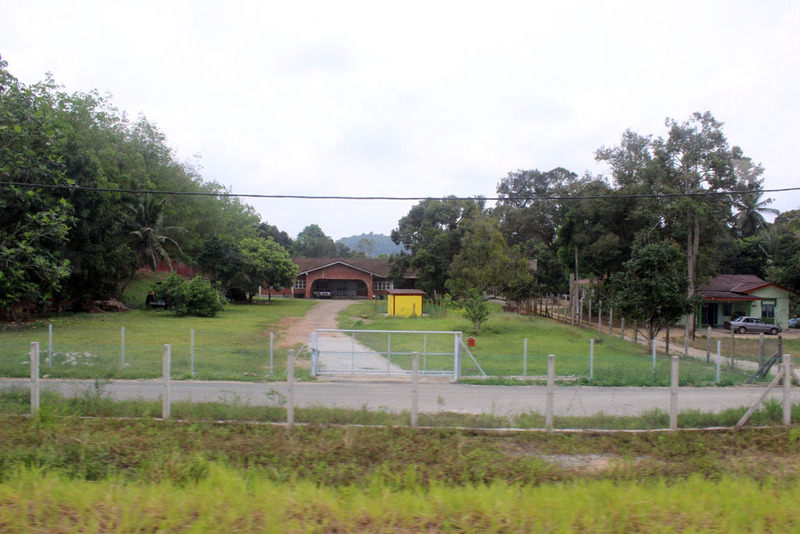 I was able to take some photos of my coach in Gemas, all without incident like in Tampin. 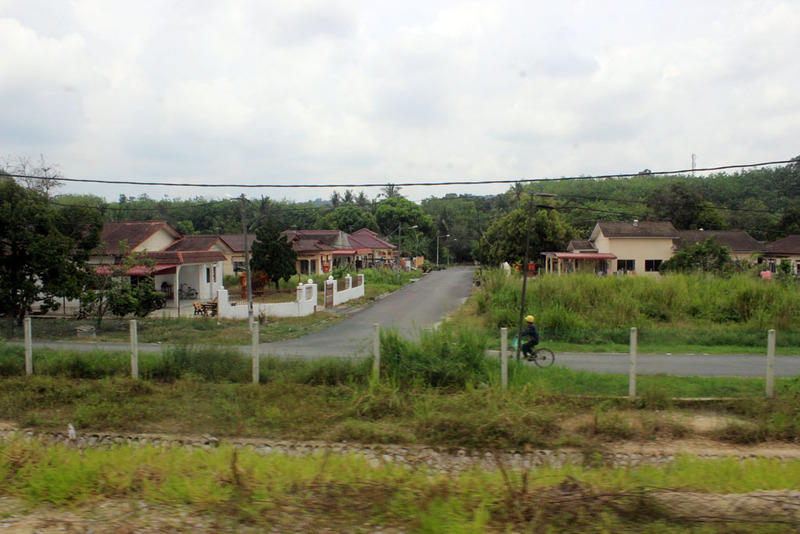 Several minutes after the train departed Gemas, I caught the glimpse of a small savannah in Batu Anam. 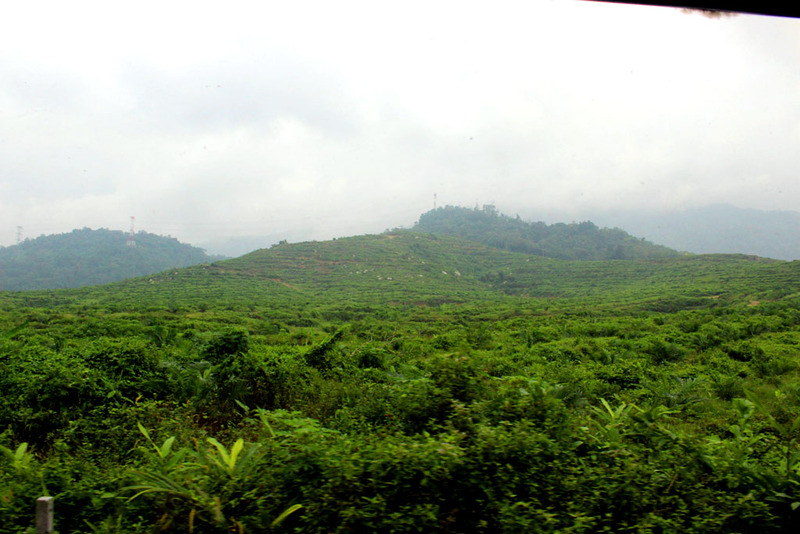 It’s quite unique sight, after we were bombarded by the endless vista of palm plantation. 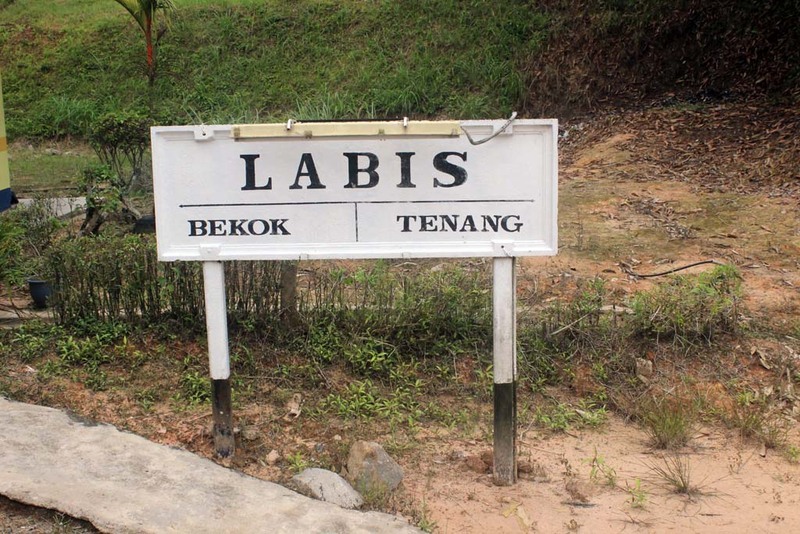 Our train makes a brief stop at Labis, where some passengers disembarked the train. 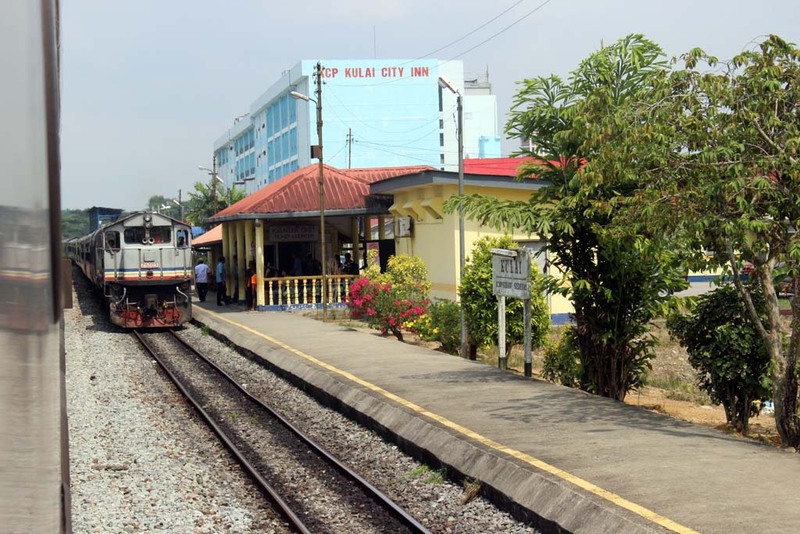 I didn’t take the picture of the remainder of our trip, except when we stopped at Kulai. 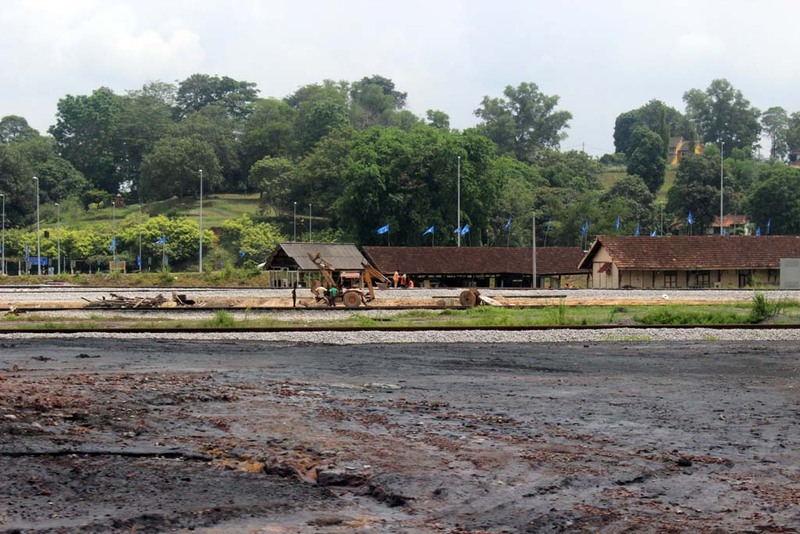 In Kulai, I did saw one unusual procedure. 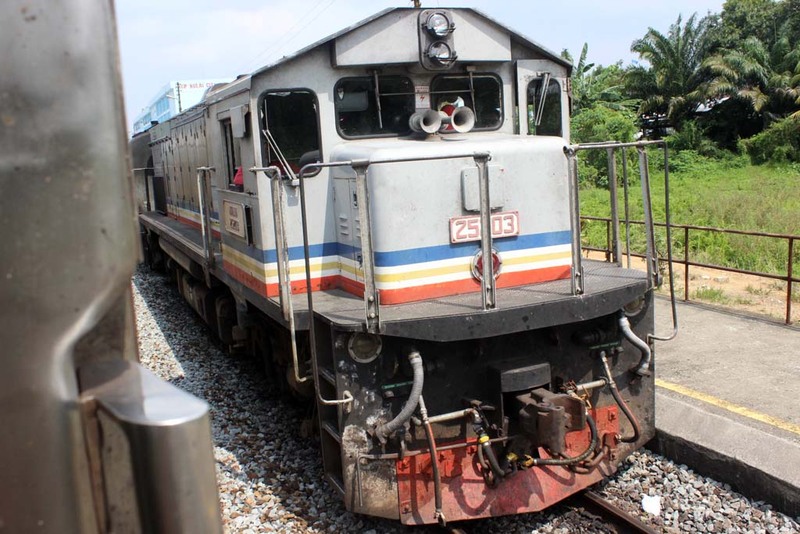 Since the train had to stop at the platform to allow passengers to disembark or embark, while on the other hand it too must give way to oncoming train from opposite direction, the driver had to shunt and reverse the train consist to the other track to allow the other train to pass. 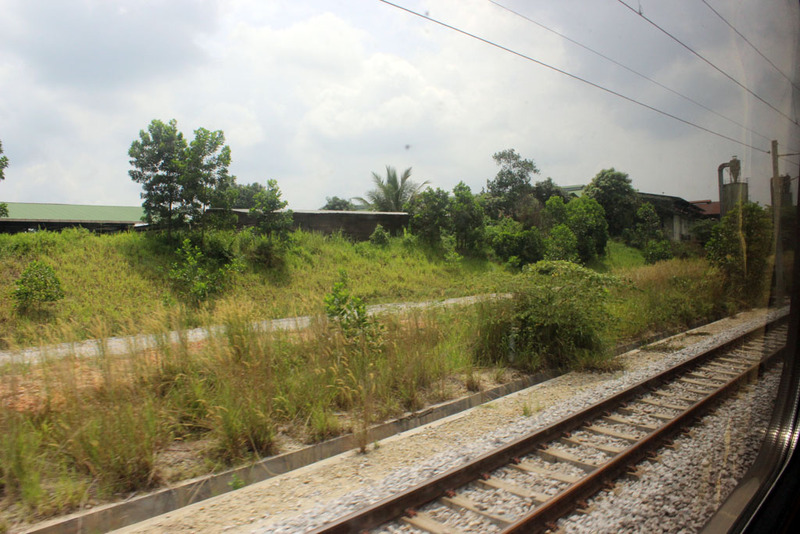 I resumed my sleep again, only to be awakened when our train arrived at Kempas Bahru. 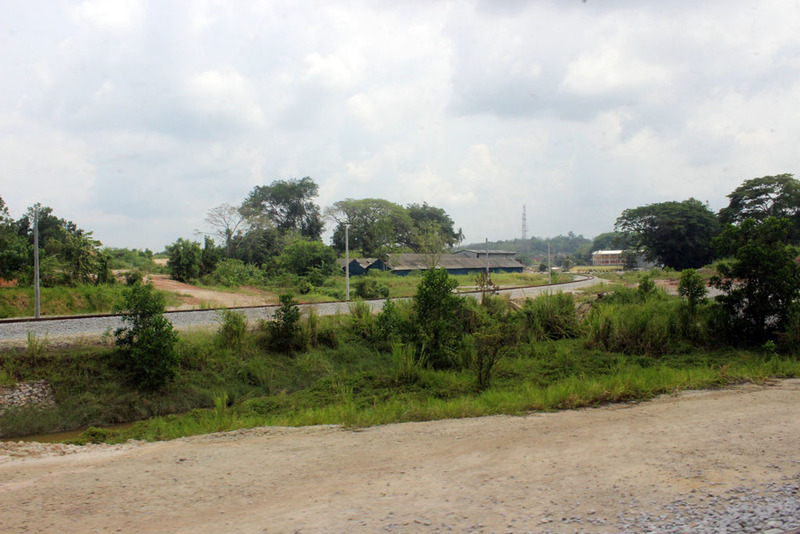 It seemed that now they began to build a new train depot nearby. It is said that it is built to replace the one lost in Singapore. At Kempas Bahru, most of the cabin crew disembark as they wont join the trip to Singapore. 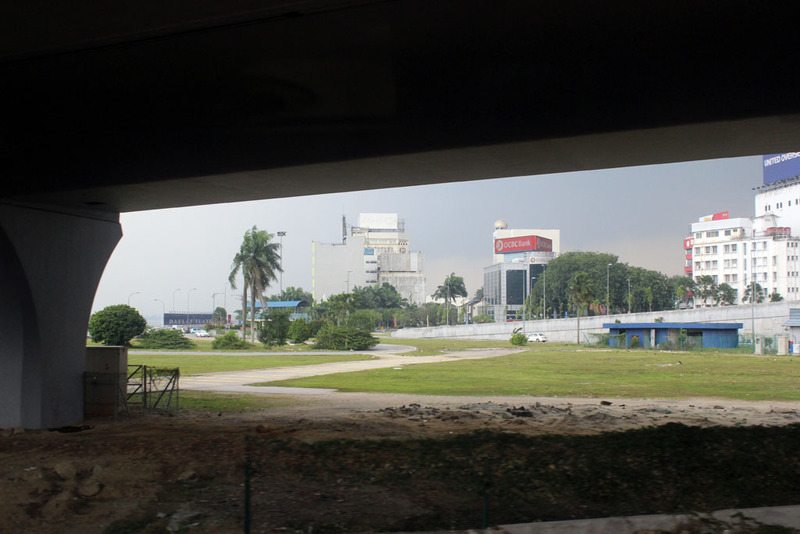 Kempas Bahru is the last stop before Johor. 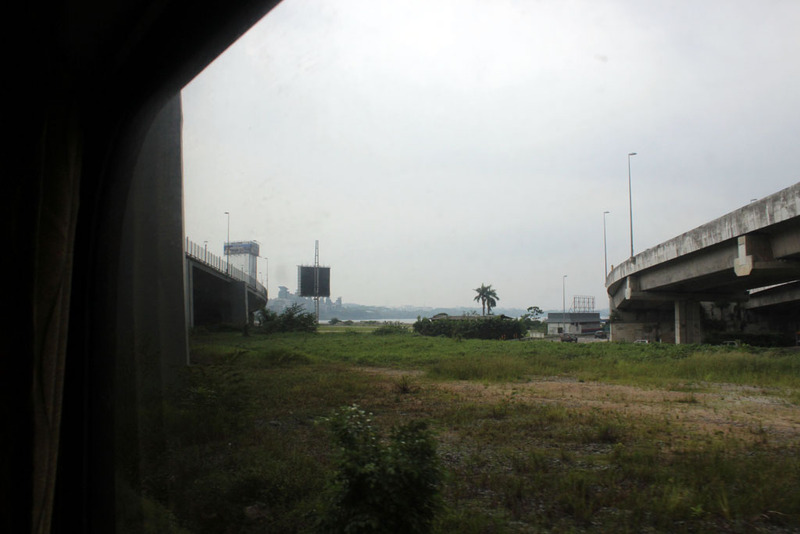 I didn’t take much photo at Johor as it was too dark. It was in JB Sentral that we had immigration checking. 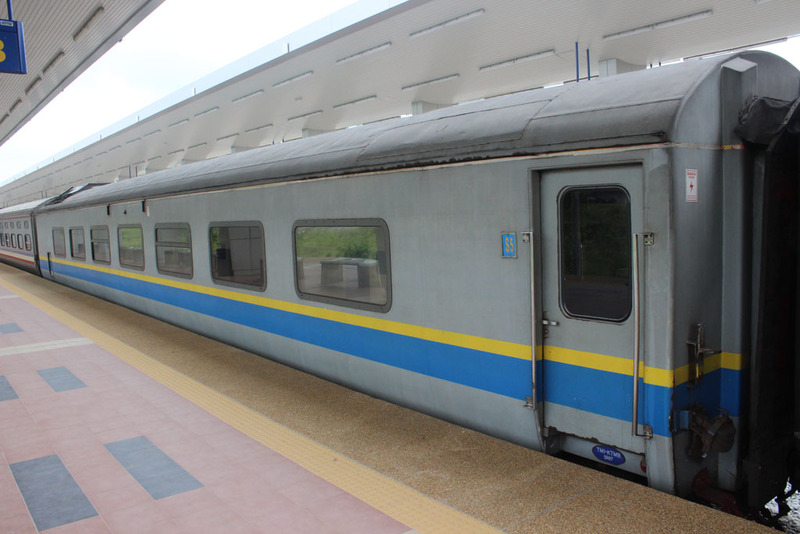 Unlike in the following Woodlands checkpoint, in this place the immigration officers boarded the train to check and stamp our passports. 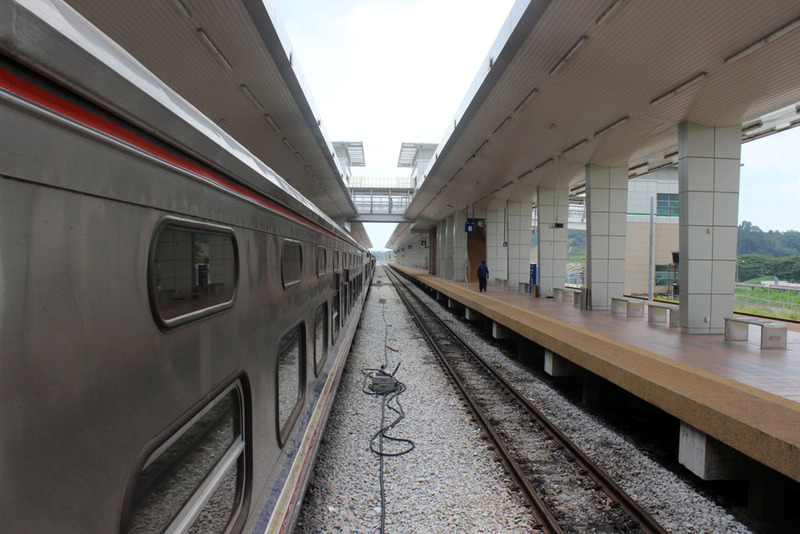 Once the passport checking completed, the train resumed its brief journey to Woodlands. 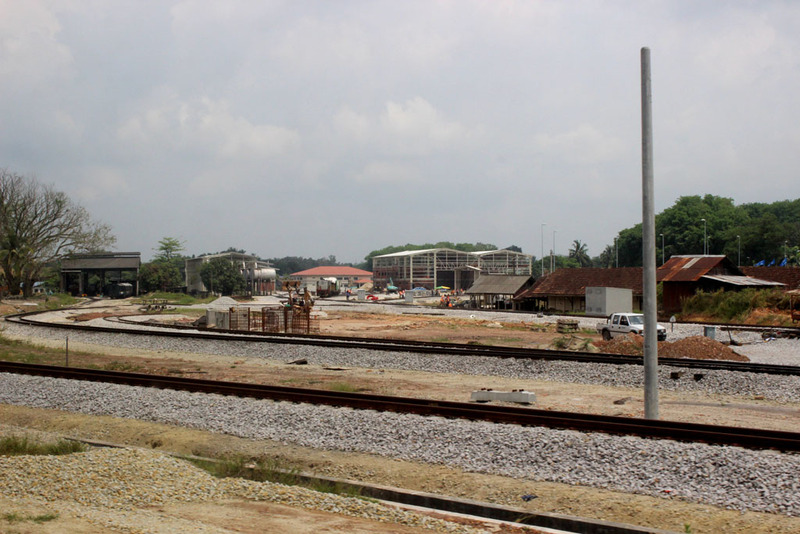 Just next to JB Sentral, there is the old Johor Bahru station which is now used as a railway museum, although unfortunately it has yet to open. 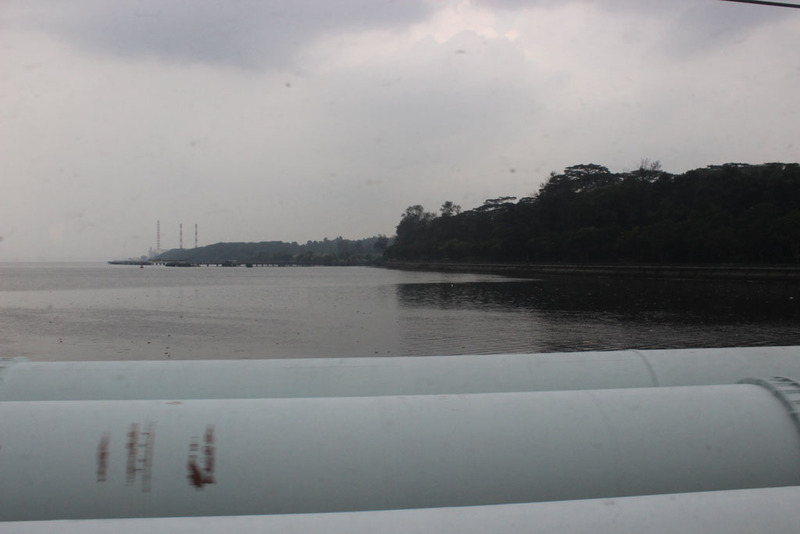 The view of the causeway bridge from train cabin. 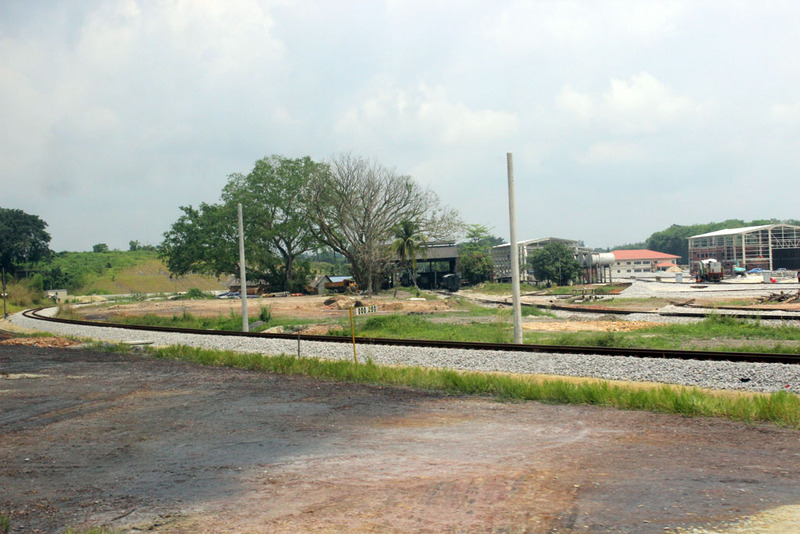 Just near the causeway, there are several stacks of used concrete sleepers. 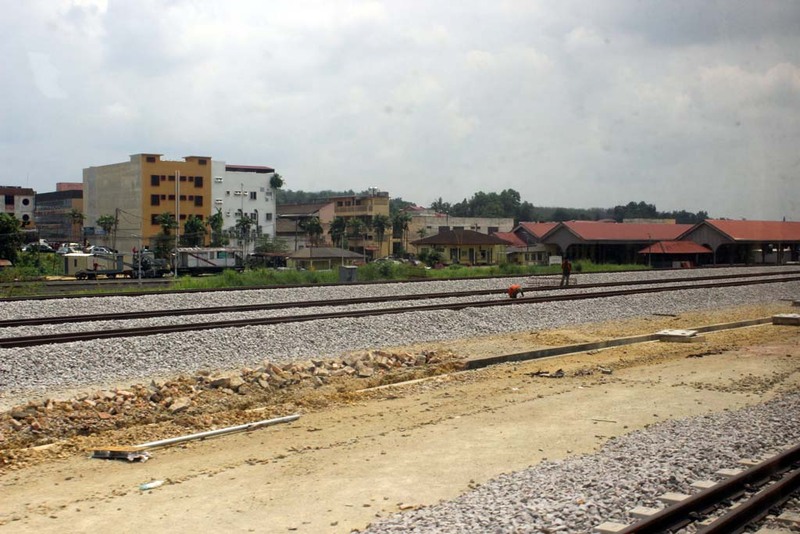 Were these sleepers were once installed in Singapore? A deserted park underneath the bridge. 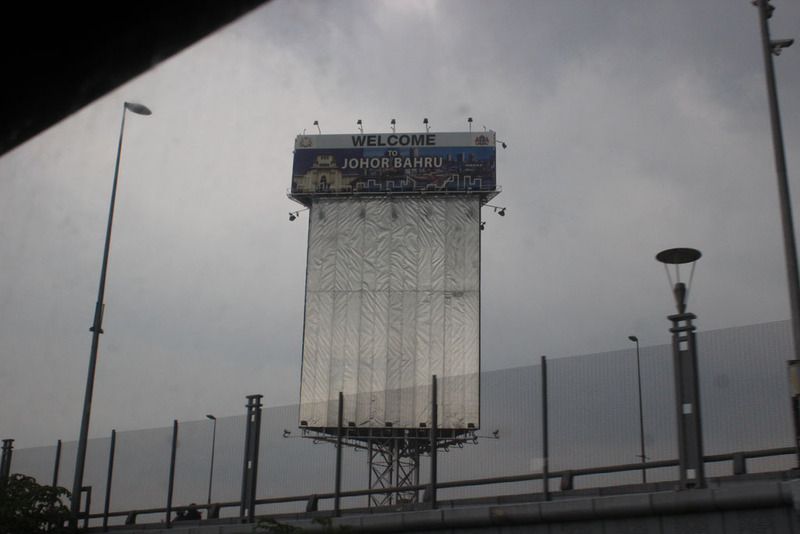 The sign looks awkward as it is could be seen by Singapore-bound travelers, yet it is not visible to Johor-bound traveler. The causeway looks rather quiet. 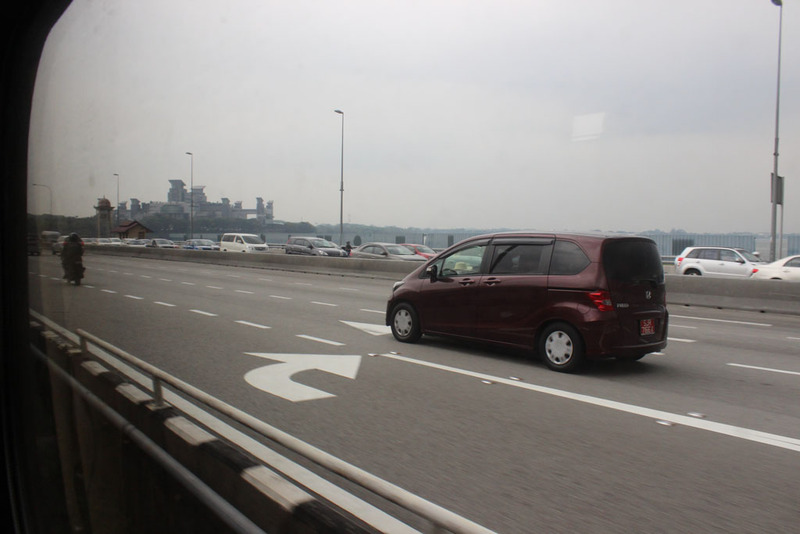 But the Johor bound lane looks packed! 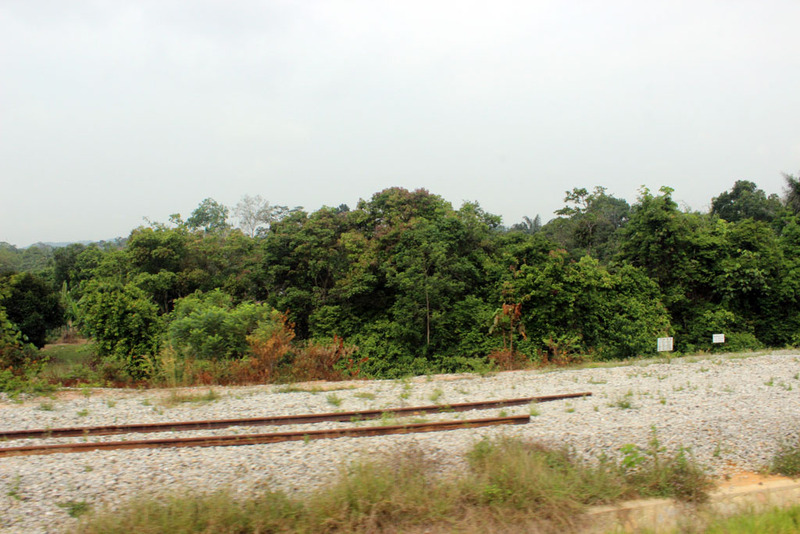 We’re getting closer to Woodlands in Singapore, and despite the absence of anything that potentially troublesome, I still felt very nervous. I am worried if I got held up again like what I had in 2011…..
That’s because the left track isn’t ready yet. 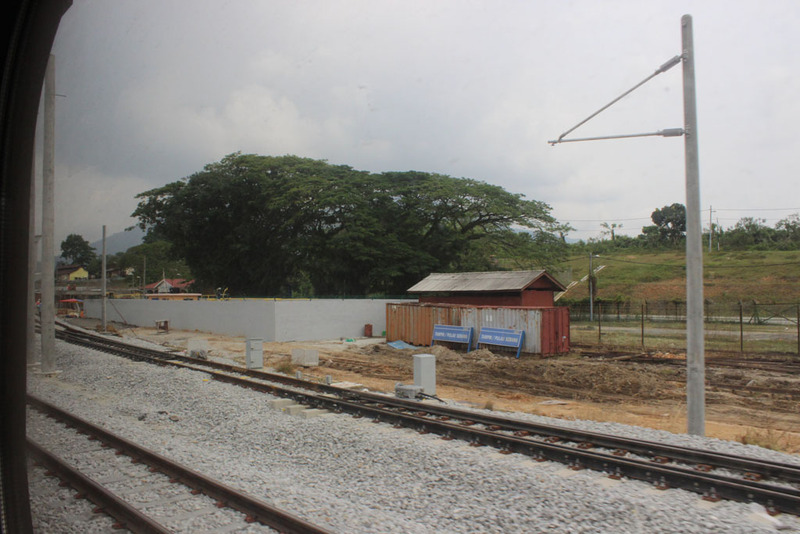 Once its completed southbound train will use the left track aka ‘down track’ while the northbound track will use the ‘up track’. 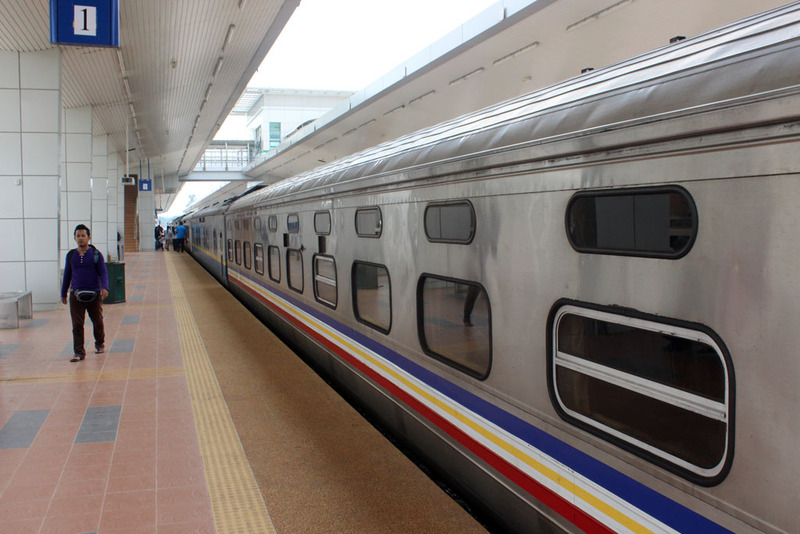 I’ve been told that this will be the main CTC for the entire KTM’s system replacing the one in Sentral KL. 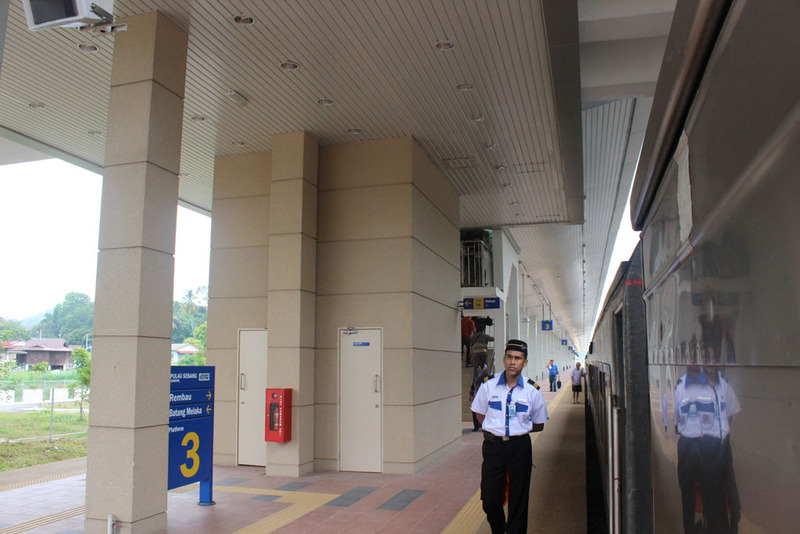 The CTC currently operating from Sentral KL will ceased to exist. 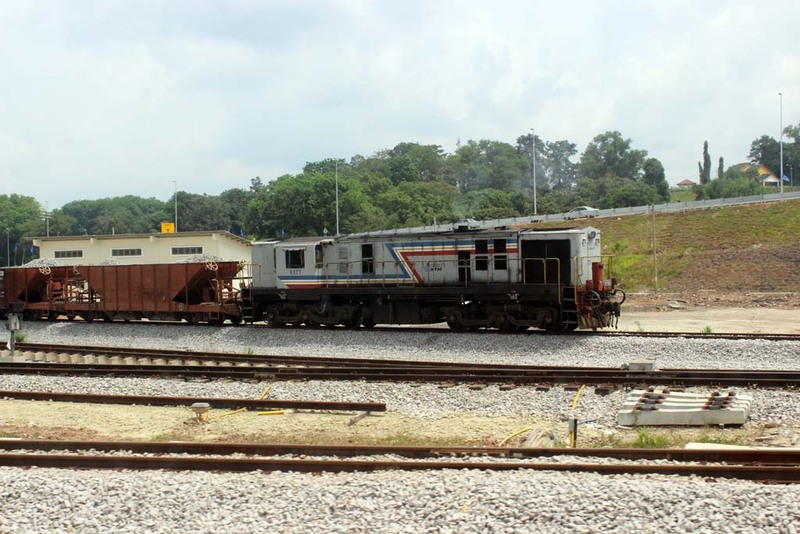 Even the Loco and coach Depoh beneath it will closed down, relegating Sentral KL depoh as running shed only. 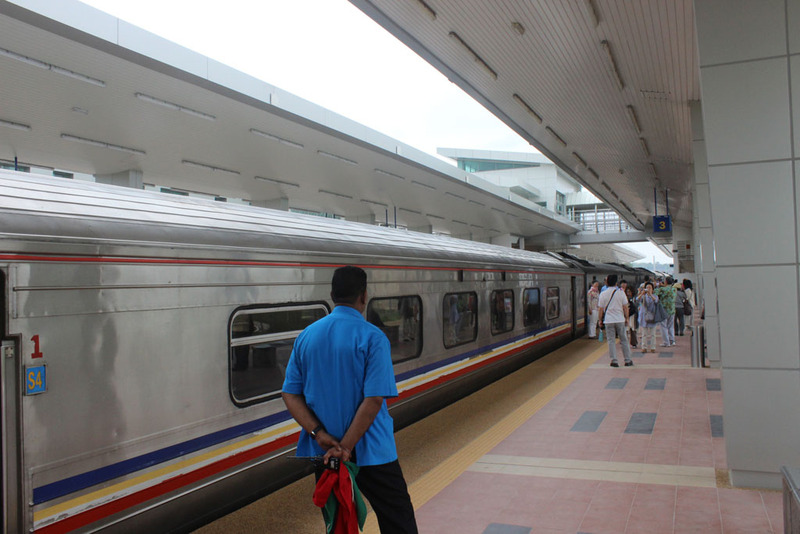 Actually this is quite common procedures all over KTM. After reading this I think what U did was quite dangerous. 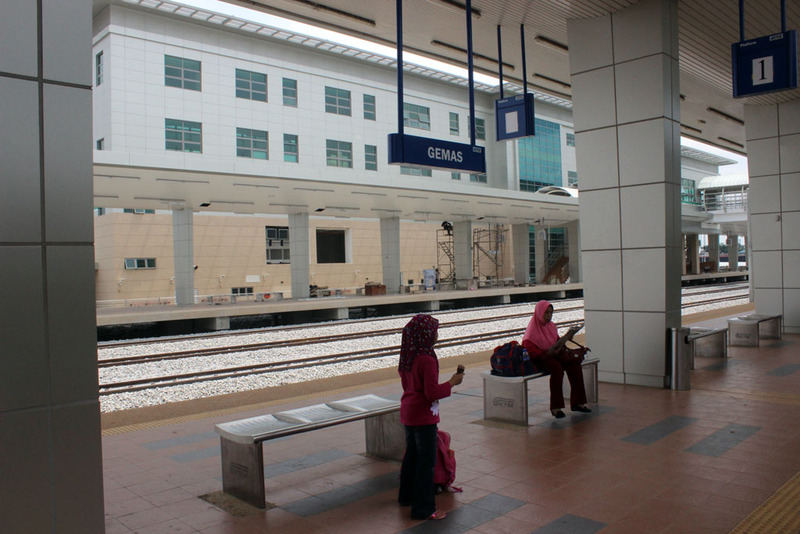 Other than Gemas, most of the time trains don’t stop that long in the intermediate stations. But what he did was not uncalled for too. He shouldn’t have call U that no matter what. 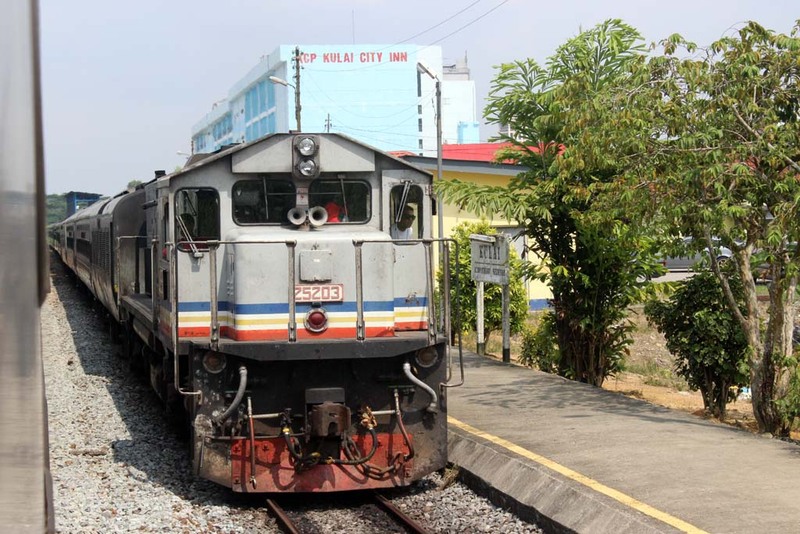 U must understand KTM of today is no more like KTM that U and we knew, we (Malaysian railfans) had our fair share of errrr interesting contact with them too………. Thank you very much for your input. 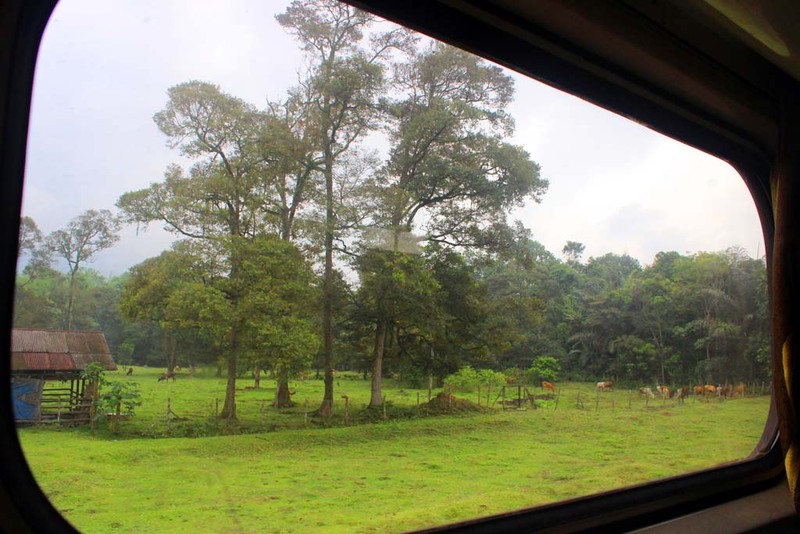 Yes, it was one-of-a-kind railway trip for me. Yes I know that what I did was quite dangerous, but his cursing was obviously a gross professional misconduct.